Highly interactive SMS application for blackberry mobile phones efficiently composes and propels limitless group messages in form of event alerts, personal messages, birthday greeting, party invitations, marketing campaigns, product promotional activities, advertisements and others. Text messaging utility facilitates users to increase sales, productivity and profitability of business companies by interacting customers in cost effective manner. ...... minimum span of time. SMS application for blackberry smart mobile phones device allow users to forward unlimited group text messages to single or multiple recipients at same time and on national or international mobile phone networks in convenient manner. Group text messaging utility frequently supports entire blackberry cell phones manufacturing brands. Most appropriate SMS application for blackberry is suitable for different sectors such as telecom industry, software companies, banks, postal departments, health care centers, financial institutions, universities, job notification, call centers etc. 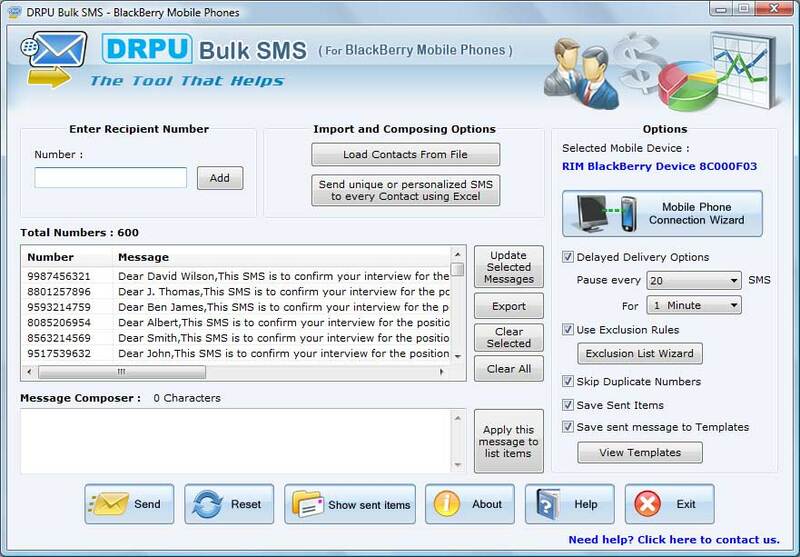 * Expertise SMS application for blackberry facilitates users to always in touch with their business partners, clients, customers, employees and others through transmitting bulk messages. Qweas is providing links to SMS Application for BlackBerry Mobile Phones 6.0.1.4 as a courtesy, and makes no representations regarding SMS Application for BlackBerry Mobile Phones or any other applications or any information related thereto. Any questions, complaints or claims regarding this application SMS Application for BlackBerry Mobile Phones 6.0.1.4 must be directed to the appropriate software vendor. You may click the publisher link of SMS Application for BlackBerry Mobile Phones on the top of this page to get more details about the vendor.